It's entirely possible to build a high-end gaming PC inside a mini-ITX chassis, it just takes careful component selection and a bit of patience to negotiate parts inside tight confines. 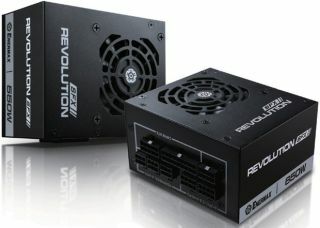 To make things a little easier, Enermax announced a new SFX power supply series, the Revolution SFX. There are two wattage options at the moment, those being 550W and 650W, both of which are 80 Plus Gold certified. Enermax says that's the highest wattage available in a 100mm depth chassis, though to be clear, there are some SFX PSUs that go even higher. Still, it's a not exactly a crowded field above 600W in the SFX space, especially if you whittle away generic brands. The 550W model offers up to 45.8A over the all-important +12V rail while the 650W kicks things up a notch to 54A, with both utilizing a single +12V rail design. Assuming the PSUs are reliable, both should be capable of powering a fully loaded mini-ITX system. To that end, a SilverStone rep posting on JonnyGuru's forum claims these are Channel Well CSM series PSUs. We don't know much about this particular model, though Channel Well has been identified on the web as the maker of some high end units, including several of Corsair's models. If you're really into these PSUs for whatever reason but aren't building a mini-ITX system, Enermax includes a SFX-to-ATX adapter for use with micro ATX and standard ATX cases. There's no word yet on when these will be available or for how much.